Managing, monitoring and updating Twitter accounts takes time and effort. Especially if you’re looking after multiple accounts. You definitely need a great app on your side to make things as simple and easy as possible. Today I want to examine the best web-based third-party Twitter clients available. Let’s take a look at what they have to offer and what’s missing. Like most social media dashboards, HootSuite uses a simple column layout. The light color scheme makes it easy on the eye and helps links and menu buttons to stand out. 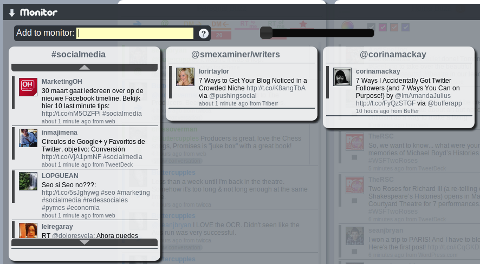 HootSuite's pop-out sidebar menu keeps the main columns clutter-free. Options for different-sized columns give the user control over the look and feel of the dashboard. Profile pictures make it easy to tell which account you are sending from. 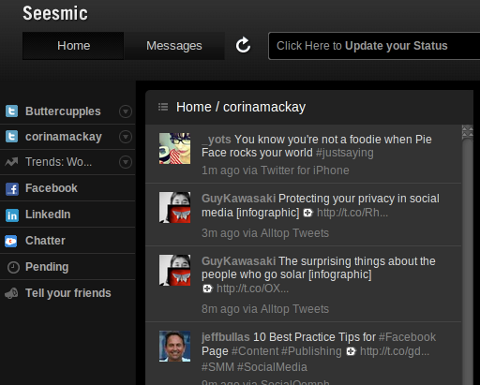 The Compose box for new updates finds a nice balance in HootSuite. It never disappears completely, so it’s not difficult to find, and yet it remains compact until clicked. Creating, scheduling and sending updates are a breeze with HootSuite. My only issue with the Compose box is that the profile pictures are quite small and in a separate drop-down box, which makes it fairly easy to forget to check which account you are using. Keeping an eye on Twitter trends only takes one click. 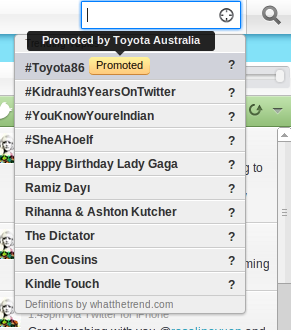 Powered by What the Trend, HootSuite automatically shows the latest trending topics on Twitter when you click inside the Search box. Searching for a keyword or user will produce a pop-up box showing the results stream. From here you can save the stream to your dashboard or search for other topics. Not only can you monitor your current Twitter lists, you can create new ones. HootSuite’s Twitter list integration is excellent, allowing you to create new lists and follow those you have already set up. Most of these features are similar—if not the same—as those offered by the other apps discussed here. HootSuite’s real standout features are the ability to easily share accounts with other team members and set up various tabs. The ability to create reports and have them sent to you automatically also makes this a great tool for monitoring business accounts. Killer feature: Tabs. It’s almost like having multiple HootSuite accounts set up within the dashboard. 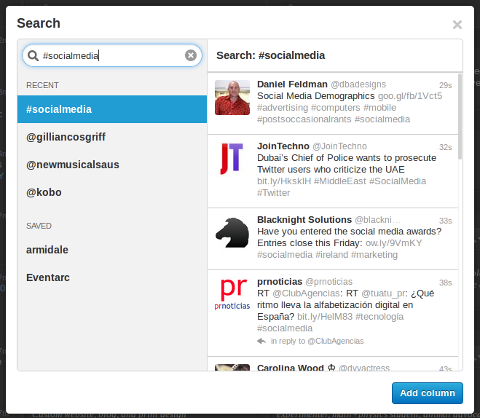 Each tab can have different columns and searches that are saved to your HootSuite account. Biggest flaw: Design. 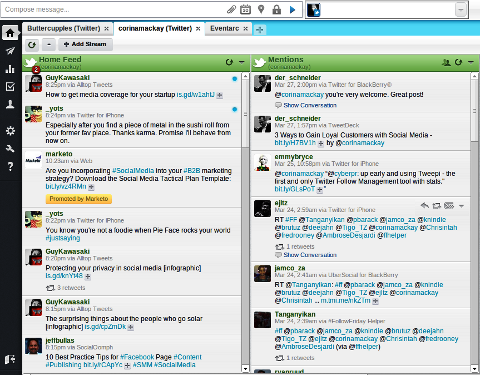 While HootSuite doesn’t look bad, the design is ordinary compared to TweetDeck and Seesmic. With so many unique features, I would use it exclusively if it looked better. One app I can’t stay away from despite its flaws is Seesmic. The design isn’t perfect, but it makes a nice change from the busy, boxy look of HootSuite. The color scheme is almost the same, although Seesmic does offer a dark option as well. Although Seesmic's design is very similar to HootSuite, rounded edges and bigger spaces between elements make for a nicer look. The option to change color schemes gives the user more variety. Many social media accounts can be connected to Seesmic, but this platform is best used for managing just one or two. A quick way to switch between accounts like HootSuite’s tab feature would improve the user experience. Not only does Seesmic offer different-sized columns, you can also switch to a list view, if you prefer to read updates this way. Killer feature: Design. Color scheme options, rounded edges, better spacing around columns and less clutter across the top of the dashboard make Seesmic more pleasant to use. Biggest flaw: Lacks features like tabs and analytics, which would make it a more robust option. With Twitter’s acquisition of TweetDeck, several things have changed—some better, some not so much. TweetDeck's column layout is one of the cleaner and simpler dashboards. The blank space in the screenshot above is one of the “not so much” changes. One of the better-known social media dashboards, and preferred by many Twitter power users, TweetDeck has sadly taken a huge step backwards with its most recent update. Column-sizing issues are a real downer in this version. On the upside, the addition of two new column types is very handy. The Interactions column shows not only mentions of your Twitter handle, but also retweets of your updates, users who follow you and users who favorite your tweets. Having all of your interactions in one place makes it easier to keep on top of your account. The Activity column includes actions from users who you follow. When they follow other users, add them to lists or favorite tweets, this will all show up here. 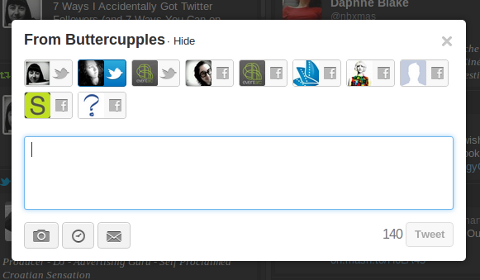 The new Update box in TweetDeck takes a different approach than Seesmic's and HootSuite's pop-out. Although hidden behind a single button above TweetDeck’s columns, the bright blue square makes the Update box stand out so you won’t miss it. The box has a simple layout, similar to both Seesmic and HootSuite, although it’s bigger and includes larger profile pictures. Clicking the profile pictures also changes the “from” statement at the top of the update box, making it very clear which account you are using. TweetDeck's search function allows you to save searches or add them to your dashboard as new columns. 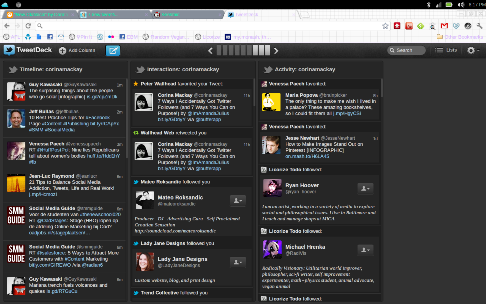 Without tabs or a similar feature, TweetDeck requires a lot of scrolling to see all of your columns. The column buttons across the top of the dashboard make this a lot easier, though. When you hover over one of the column buttons, its title will be shown, allowing you to quickly find and jump to particular columns. This is one feature I’d love to see other dashboard apps integrate. Each rectangle links to one of the columns you have created. Killer feature: New Update box. When managing multiple accounts, the easier it is to send off (or schedule) a quick update and ensure it’s being sent from the right account is imperative. TweetDeck has the most user-friendly update process. Biggest flaw: Lack of features needed to manage multiple accounts. 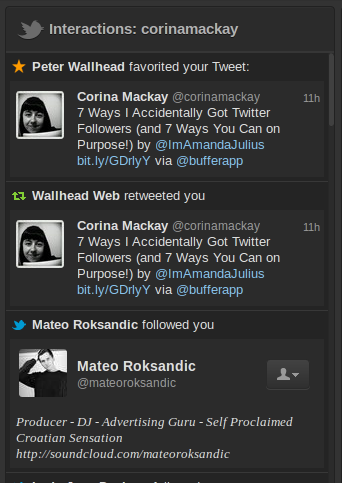 More than two accounts will make a mess of your TweetDeck dashboard. Especially if you are monitoring hashtags, lists and searches, as well as general account activity. An up-and-comer in the field of social media dashboards is Twimbow. With a focus on colors and heavy on unique features, users of Android Twitter client Twicca will love this one. Look familiar? Yet another multiple-column layout. 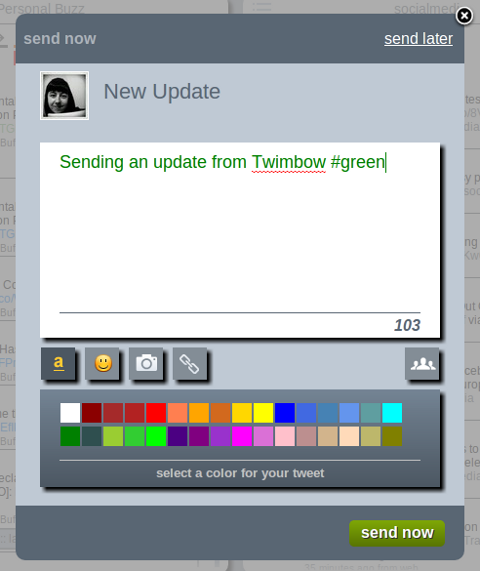 Twimbow’s feature list is impressive, and it offers the user a lot of control over the personalization of the dashboard. Color-coding is preset but adjustable, as are the items that show up in the Personal Buzz column (shown on the left in the screenshot above). With just a click, the user can select (or deselect) any type of activity within the Personal Buzz stream to show only what’s relevant. Twimbow's monitor stays hidden until clicked to preserve the simplistic layout. 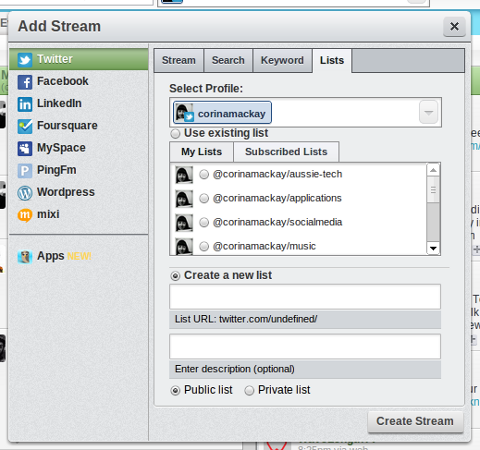 In the monitor, the user can add any kind of column: lists, searches, hashtag streams or even particular user streams. These columns can be moved with a drag-and-drop motion to fit the user’s needs. When not in use, the monitor is shown by a grey bar across the bottom of the dashboard. Similar to TweetDeck, Twimbow's Update box pops up over the main dashboard area. 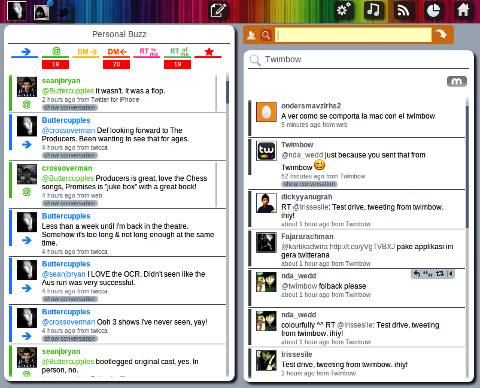 Twimbow’s unique features really make it stand out as a great personal dashboard. The color-coding options (applicable to update types, specific users or whole user lists) could make it a useful tool for monitoring business accounts or related updates as well. Of course, color schemes are available—more than any other dashboard I’ve used. 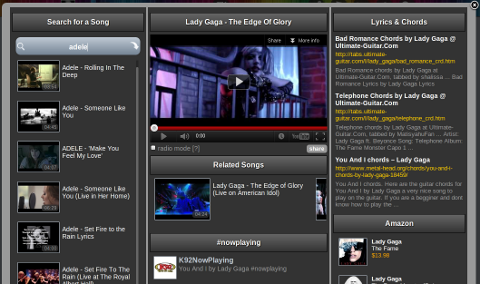 A recent upgrade to Twimbow's music player is quite an impressive feature. With the music player, you can listen not only to your favorite songs, but also turn on the radio feature to create a playlist of related tracks, see tweets tagged #nowplaying that mention the artist you’re listening to, share the songs on Twitter and track down a copy of the CD online. Twimbow's built-in RSS reader makes it easy to find share-worthy content without leaving the app. Browsing Twimbow’s top RSS feeds or adding your personal favorites will make the built-in RSS reader a handy tool for discovering great content to share. Killer feature: Personalization. Color themes, color-coding, drag-and-drop columns, built-in RSS feeds and a music player. Impressed yet? Biggest flaw: Hiding the monitor. Although the option to keep the monitor out of the way is great, not being able to have more columns in the main view makes it hard to manage multiple accounts from this dashboard. Every app has its benefits and flaws, and of course these are just my opinions. I’d love to hear your thoughts, though. Last time I wrote about Twitter apps, the majority of our readers were waiting for something to trump HootSuite. What do you think? Are you using HootSuite or one of these others? Or something else? Let us know in the comments section below. Belle has spent the past four years as a freelance writer and social media consultant and now spends her days wielding a pencil as Attendly's resident Inbound Marketer. Follow her on Twitter @BelleBethCooper.